This Hawaiian version I’m sharing today is a new favorite. 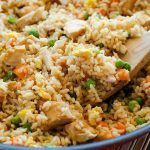 It has all the elements of traditional fried rice, but with a lot more flavor and texture. This rice is packed with diced ham, red bell pepper, and to me the winning ingredient.. pineapple! 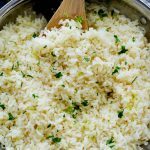 It adds a slight sweetness to every bite and makes this rice so heavenly. 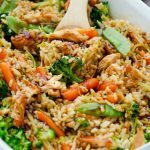 One of the biggest tips I can give for perfect fried rice is using leftover, cold rice. I think it’s the firmness of the cold rice that gives it the perfect texture. If you use fresh cooked rice, it will make the mixture mushy! So take my word for it, make the rice in the morning, or the day before, and then place it in the fridge in a sealed container. Once it’s been in the fridge for at least 6 to 8 hours it should be nice and cold and ready to go! 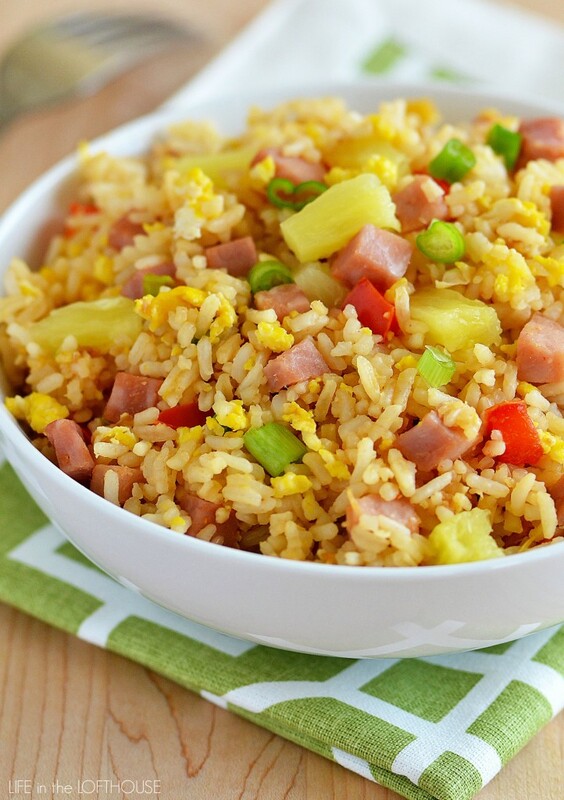 This rice is packed with diced ham, red bell pepper, and pineapple! The pineapple adds a slight sweetness to every bite and makes this rice heavenly. In a small bowl, stir together the soy sauce, sesame oil and hot sauce. Set aside. In a large, non-stick skillet, heat ½ of the vegetable oil over medium-high heat. Add the diced ham, red bell pepper and the chopped white parts of the green onions. Cook and stir for 5 to 7 minutes, or until ham is browned and bell pepper is crisp-tender. Stir in the garlic and cook another minute. Pour this mixture into a bowl, and set aside. Heat the remaining vegetable oil in the same skillet until hot, and then add the cold rice. Cook and stir rice, breaking up the clumps. Cook until rice is thoroughly heated, about 8 minutes. Push the rice to one side of the skillet. Crack the eggs onto the other side of skillet and stir until lightly scrambled and set. Stir the eggs and the ham mixture into the rice. Pour the soy sauce mixture into the rice and cook, stirring until combined and hot. Turn off the heat, stir in the pineapple and green parts of the onions. Serve! Making tomorrow so I can cook the rice today. Cannot wait!! I love fried rice to but haven’t tried a Hawaiian kind. the idea of pineapple in it sounds really good! Ive been trying to comment since last night. I hope this one works cuz its my last try. I made this rice last night for dinner and it was magnificent! I have never used that word in my life 😀 lol I did add chopped ginger but that was the only change. I think it added even more falvor. terrific recipe! This looks so good! I cant wait to try it!! Thank you! This rice looks amazing. Im making it Sunday to go with our Pork Luau neighborhood party!! 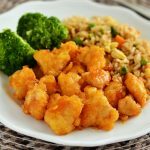 I love your fried rice recipe (and sweet and sour chicken), so I can’t wait to try this one! fried rice is really good, I’ve seen a few things and delicious, this dish looks more attractive dish I did, I would do it again. What if my rice isn’t cold? I have it in the rice cooker to be done just about a half hour before I cook. I just made this today and love it. Was the sesame oil supposed to be 1 tablespoon? Seems a bit overwhelming so I’d cut back a bit on that next time but otherwise it was perfect. I’ll be adding this to my regular rotation! Has anyone made this the day before a party and served it for the party the following day? I’m trying to find side dishes for a luau themed party and rice never reallyre- heats well (it seems anyway). Tried this rice last night, I did not make it with pre cooked rice, though after I cooked the rice I put it in the freezer to get it as cold as possible. This rice was a serious hit! So good there were no leftovers. So good that I am making it again today lol This is the second recipe I’ve made from this blog and so far everything has tasted amazing! We had a luau party and I made this rice. Absolutely delicious!!!!!!!! I have already been asked for the recipe several times. I’ll cook that for tonight and ever more daily. Hi, I made this for dinner exactly following your recipe. It is so delicious, will make it again!! Thank you for sharing. I’d like a recommendation on the hot sauce? Tabasco? Tapitia? Something else? do you usually use canned pineapple or fresh?